David Speirs (right) faces the sparse Labor benches after five MPs were ejected. As parliament resumed for its first sitting week since early December, Premier Steven Marshall hijacked the agenda by calling on immediate debate on a motion urging parliament to support his Government’s position that South Australia must work with the Commonwealth and upstream states “in a genuinely bipartisan way to implement the current Murray-Darling Basin Plan in full”. Marshall then launched a spirited defence of his Water Minister Speirs, who has been under a political blowtorch since being savaged by Royal Commissioner Bret Walker for “capitulating” to the Commonwealth and upstream states on a revised deal in December. Walker wrote that the compromise was “so contrary to the interests of South Australians that the decision by the Minister responsible is almost certainly a breach… of the South Australian Ministerial Code of Conduct”. “With due respect to the royal commission, that is a ludicrous and nonsensical comment,” Marshall told parliament. Marshall argued Speirs was “being mistakenly maligned by members opposite”. Speirs continued the attack on Walker, telling parliament “the Royal Commissioner may have a view, but that is one view”. “His title does not elevate him to an untouchable deity,” he said. But while the Premier spruiked bipartisanship, the political mood was anything but, with Speaker Vincent Tarzia struggling to impose himself as insults flew, and five Labor frontbenchers – Stephen Mullighan, Tom Koutsantonis, Jayne Stinson, Chris Picton and Tony Piccolo – ejected from the chamber, along with backbencher Michael Brown. Labor was also incensed that the Government overturned a request for a parliamentary pair for backbencher Jon Gee, who is ill.
Liberal frontbencher John Gardner told InDaily the Government needed an absolute majority – 24 out of the nominal 47 members – to suspend standing orders for the debate. “The view that we’ve had – and it’s certainly my strong view – is the requirements for a vote to suspend standing orders mean you must have an absolute majority of members present and an absolute majority voting for it,” he said. Koutsantonis, the manager of Opposition business, said such a move had “never happened before in the state, to my memory”. “The last Liberal leader to do this was Matthew Guy,” he said, referring to the former Victorian Opposition Leader’s controversial move last year to order two of his MPs back into parliament for a crucial Good Friday vote after they had been given paired leave to observe the religious holiday. “It’s just not done, full-stop,” Koutsantonis said. The lack of bipartisanship was evident, too, in a Labor bid to undermine Speirs in his southern seat of Black, which he held by a margin of 8.7 per cent at last year’s election. He previously won the former seat of Bright by just 3.3 per cent in 2014. Labor has printed 15,000 leaflets highlighting the Royal Commissioner’s critique of Speirs, to be distributed to every household in the electorate – an unusual move for an Opposition so far out from an election, suggesting Labor believes the MP is a vulnerable political target. The front of the leaflet. “We believe it is important for this to be drawn directly to the attention of people in his electorate of Black in Adelaide’s southern suburbs,” an ALP spokesman said. 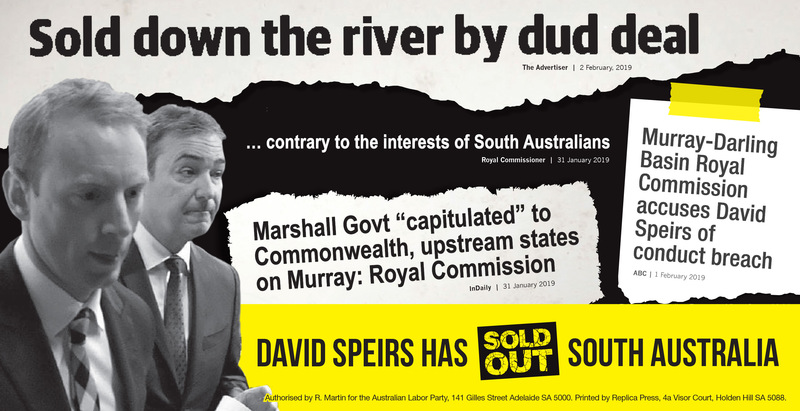 Speirs hit back, telling InDaily the campaign “just shows that all the Labor Party is interested in is political point-scoring when it comes to the River Murray”. “While I am working to deliver real water from interstate to our precious river they are busy coming up with meaningless slogans, designing pamphlets and letterbox dropping in my electorate,” he said. Labor is in campaign mode in Black. 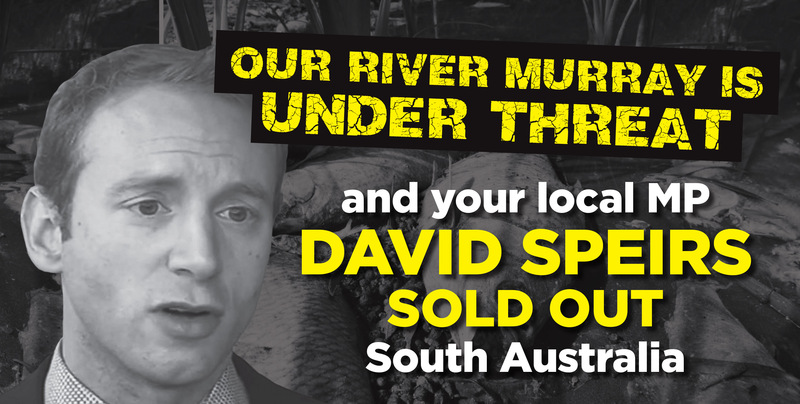 With the Liberals keen to wrest back momentum on the Murray, Speirs has again begun spruiking the prospect of ramping up the mothballed desalination plant to offset pressure on the river – a prospect he first announced in December. It’s an ironic about-face for the Liberals, who have long criticised the $2 billion plant – with Marshall himself previously calling it a “scandalous waste of money” and Speirs, in 2017, citing a Productivity Commission finding that it was “double the size that it ever needed to be”. While the Government monopolised the chamber today, Labor is also set to go after Speirs in the Legislative Council with the establishment of an Upper House inquiry to delve into the issues raised by the royal commission. Draft terms of reference obtained by InDaily show the inquiry is likely to investigate the decision to endorse the new deal in December, “what advice, and from whom, was considered by the SA Government and the Minister in making the decision” and the rationale for supporting the socio-economic criteria insisted on by the upstream states. The committee will also examine “what advice the Minister sought that the SA Government was legally able to override the existing socio-economic criteria outlined in the Basin Plan”.